The extraction of medicinal compounds from the cannabis plant has been done for thousands of years. Cannabis, along with other plant-based medicine was only recently was taken away from humans during the Industrial Revolution in America; with the arrival of the pharmaceutical Industry and synthetic medicine, initially developed with petroleum byproducts as recently as the 1800s. Apothecary, or the formulations of remedies from plants, was our go-to for prevention and remedy. Cannabis extractions were used in more than 250 medicines, by companies who crossed over from Apothecary to pharmaceutical manufacturing we know today. The first known protest for cannabis as medicine was done by physicians, arguing that it was a superior compound to morphine - which was said to be highly addictive with negative side effects. The sole reason cannabis was replaced by morphine was due to the patent of the hypodermic syringe, sold for home use in the Sears & Roebuck catalog. Since cannabis oil was not water soluble at the time (it is today), it could not be used with the syringe, and morphine was the alternative that became the norm. 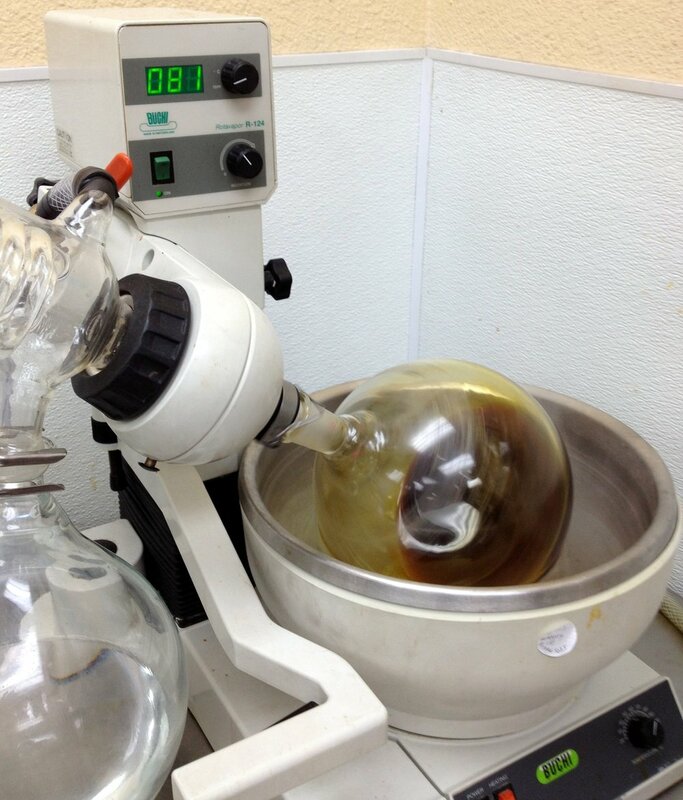 Cannabis is tested for potency and purity at Organa Labs in Denver Colorado. Nearly 20 years ago, Canadian Rick Simpson reformulated an old cannabis recipe he found online for his own use, and began sharing the recipe around the world. The recipe is an extraction of the essential oils of the plant using an alcohol reduction. It's an age-old recipe, with an added protocol by Mr. Simpson, used by thousands of people with great success around the world today (see Recipes page). Studies from Israel as early as the 1960s show THC (tetrahydrocannabinol), the compound that causes psycho-activity, (the "high") killing cancer cells. Further studies in Spain the last 15 years confirm the findings. Irregardless of studies, the plant prevails, with people healing themselves, and recipes shared globally, with much success, for a plethora of serious ailments - causing many to lament, the findings are too good to be true. Cannabis oil ready to be put into syringes at Organa Labs, Denver, Colorado. What's the difference between Cannabis Oil and tincture? Cannabis oil extracted via an alcohol reduction can test with upwards of 90 percent activated THC. This is due to the process of cooking down the pure terpenes, or the essential oils of the plant. A tincture is made from either soaking plant material in an ingestible alcohol base; or simmering or steeping in a liquid (see Recipes), and can have a THC content upwards of 50 percent. The difference is how the dilution of the medicinal compounds was achieved, and how much of the end product are beneficial plant compounds. What's the difference between FECO and RSO? There are many misunderstandings when it comes to the process and protocols of different cannabis products, but none so confusing as with the stronger oils created for serious ailments. FECO is the acronym for Full Extract Cannabis Oil. This is what all cannabis oil could be called. It's a simple title for a specific process of extracting the terpenes or essential oils from the plant, as stated above. RSO is the acronym for Rick Simpson Oil. As mentioned above, Mr. Simpson recreated an old recipe he found online, then proceeded to share it for the greater good. He did not name the oil after himself, others began referring to it as such, out of practicality. It's basically an alcohol reduction. The difference between the two is the recipe, process, and specific protocol. Mr. Simpson used Naptha while he was in Canada - a food-grade solvent. In American it's industrial-grade, and not meant for human consumption. This distinction has caused some uproar within the cannabis community, as advocates of clean medicine steer people away from solvents, encouraging the use of grain alcohol. The major difference between RSO and FECO recipe is the soak period. FECO makers use a long soak of grain alcohol and plant material. Some soak for days, weeks, or more. 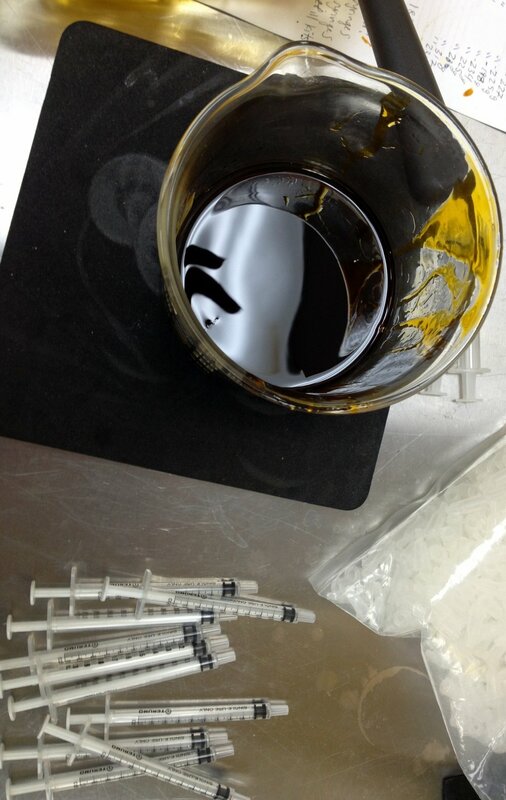 RSO is a short soak, lasting just three to four minutes. The terpenes or essentials oils of plants are fragile and stripped from the plant quickly in the alcohol, which is why Mr. Simpson recommended the short soak. Other medicine makers claim benefits in compounds within the plant, such as chlorophyll - giving most FECO products a bright green color. When comparisons have been done of the two oils in laboratories, it was found that the longer the soak, the less beneficial compounds remain, or are diluted in the final product. RSO recipes tested upwards of 90 percent activated THC (the compounded needed to kill cancer cells, for instance); with FECO products testing upwards of 50 percent or less. When querying FECO makers on dosing for an ailment, such as cancer, I could find no protocols. The documented protocol for cannabis oil made with an alcohol reduction, is 60 grams in 90 days, with a step-up dosing guide, allowing the patient to get used to the high THC and psychoactive properties of the formula. When using suppositories, you can dose a larger amount right away, as the oil will go directly into the blood stream, bypassing the liver - which causes psychoactivity. The documented protocol for cannabis oil made with an alcohol reduction, is 60 grams in 90 days, ingested. With a step-up dosing method to get used to the highly psychoactive THC. Using suppositories is a non-psychoactive delivery of the medicine directly to the blood stream; bypassing the liver that causes the head-high. Suppositories allow a larger dose to be delivered right away, as it bypasses the step-up dosing needed for oral delivery. When using suppositories, there is no head high, and the 60 grams can be administered one gram a day right away, giving much needed relief from symptoms much quicker. Tools of the apothecary trade: rice cooker, tincture bottles, syringe, capsules. Ground cannabis - whole plant: buds, stems & leaf (crystal shake w/small buds work, but you must have an ample amount of buds in order to extract the necessary compounds for whole-plant remedy. Grain alcohol - The amount of alcohol used depends on the amount of plant material you have to cover. 1) Place ground material in a glass or stainless steel container, preferably with a pour-able spout; cover with alcohol. 2) Let soak for less than five minutes. The greener the liquid is, the more chlorophyll is in the mix, and the weaker the beneficial compounds of THC and CBD, et al will test. This fact was discovered per lab results of a long soak vs. a short soak. The long soak tested upwards of 47% activated THC, while the short soak tested upwards of 80% THC. Depending on what the oil is needed for, a higher THC count is needed to kill cancer cells. 4) Pour into a rice cooker, set to warm, with lid open - near an open window for ventilation, as the alcohol is flammable. 5) Reduce until the oil is dark golden and thick, with no traces of alcohol on the surface - which will show up as a swirling element on the oil. 6) Store in measurable syringes (no needle), or mix with coconut and fill capsules or suppositories. I typically use one liter of alcohol to four cups of plant material, taking three to four hours to cook down. The amount of oil made depends on the amount of essential oils or terpenes in the plant material. Wipe down everything using alcohol or coconut oil to clean. How much oil per capsule or suppository is up to you, based on your ailment. I typically add two tablespoons of coconut oil to the oil made with four cups of plant material, making 90- 100 capsules.